Share the post "John and Anne Gerwig Director’s Fund Award – John Gerwig’s Remarks"
Dr. John L. Gerwig, Director of Rutgers Cooperative Extension 1962 – 1992, gave the following remarks on May 4, 2016 at the first awards presented to Cooperative Extension Faculty from the John and Anne Gerwig Director’s Fund. “I learned long ago that if you make short comments that they can’t be all wrong. First I would like to congratulate all of the recipients of the awards here today. We never do enough to recognize outstanding work. As you know we are celebrating the 250th Anniversary of Rutgers. Some think that I am so old that I was here when it was founded. I have been associated with Rutgers for 64 years. That is 25% of the time that Rutgers has existed. 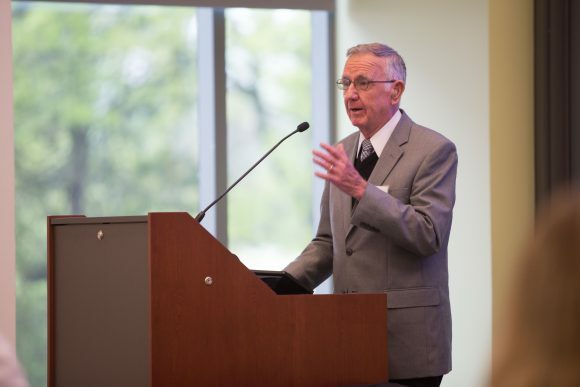 “When I first came to the Rutgers campus in 1952, I was lucky enough to know some of the early Faculty members that made an outstanding contribution toward the betterment of mankind. My office was in Lipman Hall and Dr. Selman Waksman, who discovered antibiotics that wiped out T.B., was housed in that building as well. It was a soil sample taken from the area where the dairy barn is located that contained the antibiotic that became known as Streptomycin. Lipman Hall was named for Dr. Jacob Lipman who was one of the early deans of the College of Agriculture, the forerunner of the present school. Another famous member of the faculty was Dr. Schermerhorn who selected the famous Rutgers tomato which has now been resurrected and will be grown on farms and gardens throughout the world. The Rutgers tomato has probably done more to put Rutgers on the map than any other contribution. The Rutgers tomato was grown in our garden where I grew up and was what I knew about Rutgers until I came here to teach in 1952. There was Dr. Blake who made New Jersey famous for the peach varieties that still make up a large part of the peach acreage in Eastern U.S. There was Enos Perry that introduced artificial breeding in the country. This was a major factor in raising the milk production in the U.S. It also decreased the injury among dairymen because dealing with dairy bulls was a major contribution to the injury of dairymen on the farm. These pioneers and others like them established the basis of our heritage. “Then you come to my generation and you have faculty like Dr. Reed Funk the plant breeder that put New Jersey on the map as the foremost turf grass program in the world. He was the first plant breeder to make a successful cross of Kentucky Grass. This cross can only be made at four o’clock in the morning. I asked him how he happened to be making the cross at that time of day and he said he couldn’t remember whether he had just come to work or was just ready to go home. The varieties that he produced now make up about 75% of cool weather grasses that are grown in this country. New Jersey’s blueberry and cranberry breeding program is foremost in the country. A Miss White, not a faculty member of Rutgers but who worked closely with Rutgers scientists, was a native of the pine barrens and is given credit for developing the high bush blueberry varieties that are the basis for most blueberry production today. She gathered her breeding stock by offering local natives a dollar for any plant they would bring her that had berries so big that they would not pass through the ring that she wore on her finger. There was Dr. Phil Marucci who is credited with saving the blueberry and cranberry industry in New Jersey. The present national center for this industry is located at Chatsworth in the pine barrens and bears his name and named in his honor. There was Harold Haskin who is credited with saving the oyster and shellfish industry. The Shellfish Research Station at Shell Pile is named in his honor. “Now we come to the present day people that perhaps you know. There is Bill Roberts whose design of plastic greenhouses revolutionized the industry and his design is now used worldwide. There is Dr. Bruce Clarke that is nationally recognized for his many contribution as a Plant Pathologist to the turfgrass industry. He recently was recognized by the U.S. Golf Association for his achievements. We have Dr. Barbara O’Neill who has received numerous national awards for her contributions in the field of Financial Management. She was recently recognized by the National Association of Family and Consumer Scientists. Dr. Audrey Burkart also received that award. Norm Smith, an Ag Agent in Cumberland County, was nationally recognized for his contributions to the vegetable industry. Led by Ken Pickett our 4-H Agents have had 6 agents appointed to the National 4-H Hall of Fame for their contribution to the young people of our state and country.